Bouquet garni, an aromatic bundle of herbs (the term is French for “garnished bouquet”), is a seasoning for some of the world’s favorite dishes. It’s called upon to flavor dishes such as Beef Bourguignon, Bouillabaisse and Osso Bucco. It’s a go-to seasoning for sauces, soups and stocks. Bouquet garni is classically tied with string and enclosed in cheesecloth, for easy removal at the end of the cooking process. The herbs can also be added into a sachet (the type that are also used to fill-your-own tea bags); and you can use a tea ball. But what if you have no cheesecloth? No sachet? No tea ball? Use a couple of coffee filters (or just one if the herbs fit). Insert the herbs, tie it closed and add it to the pot. *Did you realize that Simon & Garfunkel were singing about bouquet garni? Here’s the background of the song, Scarborough Fair. 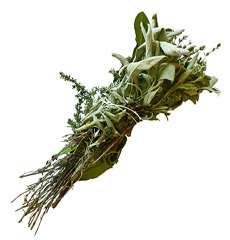 A bouquet garni of bay leaf, sage and thyme. Photo © David Monniaux, courtesy Wikimedia.